Dr. Senehi is the founder of Facial and Oral Surgery Institute in Southern California. He is a dual degree Oral & Maxillofacial Surgeon, DDS, MD, as well as being extensivelytrained in administering various levels of anesthesia in an outpatient setting. Hefounded the FOS Institute in order to offer his patients superior services with the most technological advancements in the field. UT Southwestern Medical Center / Parkland Hospital, one the most prestigious programs in the field of Oral & Maxillofacial Surgery. Organization Recognition Award, Association of Professors and Scholars of Iranian Heritage Recognition Award, Dean’s Honors List at UCLA and Herman Ostrow School of Dentistry of USC. Dr. Senehi is a recent grant recipient from Texas-Israel Chamber of Commerce, Science and Education Foundation, which provided an opportunity for him to complete a Surgical Rotation at Rabin Medical Center in Petah Tikva, Israel. 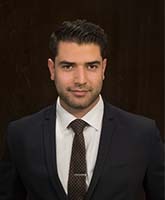 This experience allowed him to expand his clinical knowledge, surgical skills and become familiar with different prospective, theories and techniques in the field. Recently, he was honored by having been voted one of “America’s Top Dentists of 2015”. As the founder of Facial and Oral Surgery Institute, Dr. Senehi’s mission is to provide the most optimal care through extensive communication with patients, and comprehensive discussion of treatment options. Specializing in procedures that are not only innovative, but unique is quickly establishing him as one of the authority figures in his field. Dr. Senehi offers a full scope of facial & oral surgical procedures from pediatric to senior patients with care, compassion and competence.